(Sebastes maliger) These members of the Rockfish family are solitary and like to hang out close to the bottom, on or near rocks and boulders. They like chasing after Spot prawn and small crabs for food and can be easily identified by their mottled brown and yellow pattern. 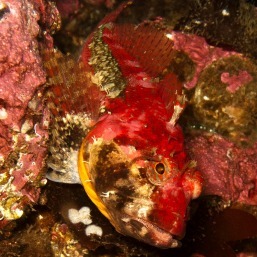 Look for Quillback Rockfish when diving at Three Tree Point. (Nautichthys oculofasciatus) Named for their elongated dorsal fin, Sailfin Sculpin are nocturnal and can be commonly found during night dives at Alki Seacrest Park (Cove 2) in West Seattle. They range in color from yellow-brown to yellow-grey with dark bands on the body and unusual scales that have a velvety texture. 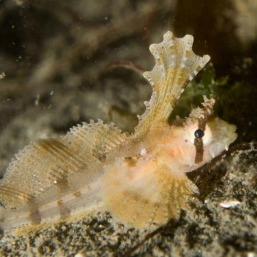 Sailfin Sculpin migrate up to the intertidal zone in late winter and early spring to spawn. (Oxylebius pictus) Like Clown fish in the South Pacific, Painted Greenling (especially juveniles) have a symbiotic relationship with fish-eating anemone and will hide from predators in their stinging tentacles. Painted Greenling are easy to find day or night at Redondo Beach. (Hemilepidotus hemilepidotus) These beautiful fish are members of the sculpin family and can be found resting near rocky areas. Use a dive light to see its brilliant red coloring, but be careful not to touch one as they have poisonous spines that can injure a diver. A good dive site to see one is Alki Junk Yard in West Seattle. (Ophiodon elongatus) These can be some of the biggest fish that a diver will see in Puget Sound, growing up to 5 feet in length and weighing in at 130 pounds. The largest example in Puget Sound can be fount at Edmonds Underwater Park. Lingcod can be very territorial (especially during egg season) and will charge and even bump into a diver that gets too close. 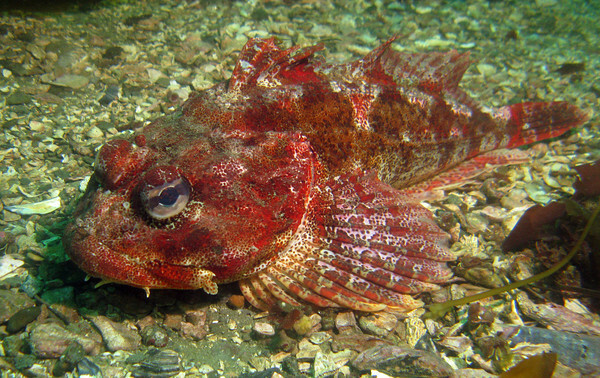 Lingcod will eat almost anything, including Rockfish and even small Giant pacific octopus. In turn, Lingcod are eaten by Harbor seals and California sea lions. After spawning earlier in the year, male Lingcod in the Pacific Northwest are now out in force protecting their nests from predators. Females leave the chore of watching their unhatched eggs to the males, who will aggressively chase away any threats. 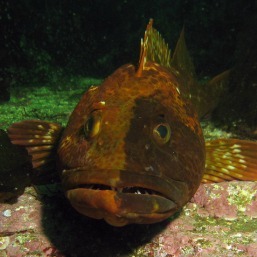 Divers who have gotten too close to a nest have reported receiving a warning “bump” by a protective Lingcod parent. These can be some of the largest fish you’ll see in Puget Sound. Smaller Lingcod range between 10-15 pounds, while the largest examples are at Edmonds Underwater Park where 50-70 pounds is not unusual. Other good dive sites for viewing include Saltwater State Park and Alki Seacrest Park (Cove 2). 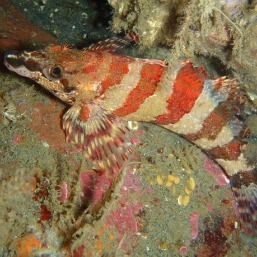 Neither a Ling nor a Cod, Lingcod, Ophiodon elongatus, is closely related to another fish found only in the Northwest, the Kelp Greenling. 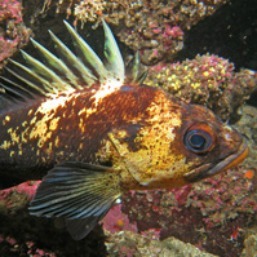 Lingcod are found along the Pacific Northwest from Oregon to Alaska, divers can usually observe juveniles in the shallower eel grass beds while adults prefer rocky bottom areas. I’m constantly amazed by the coloring variation in Lingcod, with black/white, blue/purple, and tan/brown 3 of the most common color themes. Once the Lingcod eggs have successfully hatched, the larvae enter a pelagic stage, where they float about, until late May or early June, when they find a eel grass bed and live as juveniles. After maturing, the young adults move to the rocky bottom areas. Lingcod at all stages eat a wide variety of prey, including Rockfish, Red octopus, and smaller Giant pacific octopus. More than once we have observed a Lingcod with tentacles coming out of its gills from a freshly devoured Red octopus. Lingcod themselves can also be preyed upon by Harbor seals and California sea lions. With its high reproductive rate, Lingcod are not considered threatened at this time. With Lingcod nesting season here, now is a good time to book your dive tour and see these amazing creatures in their Pacific Northwest habitat. Chen Hsu and Chris Chambers at their wedding ceremony. Congratulations Seattle Dive Tours Divemaster Chen Hsu on his marriage today to his longtime partner, Divemaster Chris Chambers. The ceremony was held at Edmonds Underwater Park, a popular Seattle dive site. Immediately after the beachside ceremony, the wedding party went on an afternoon dive followed by a reception attended by family and the local diving community. 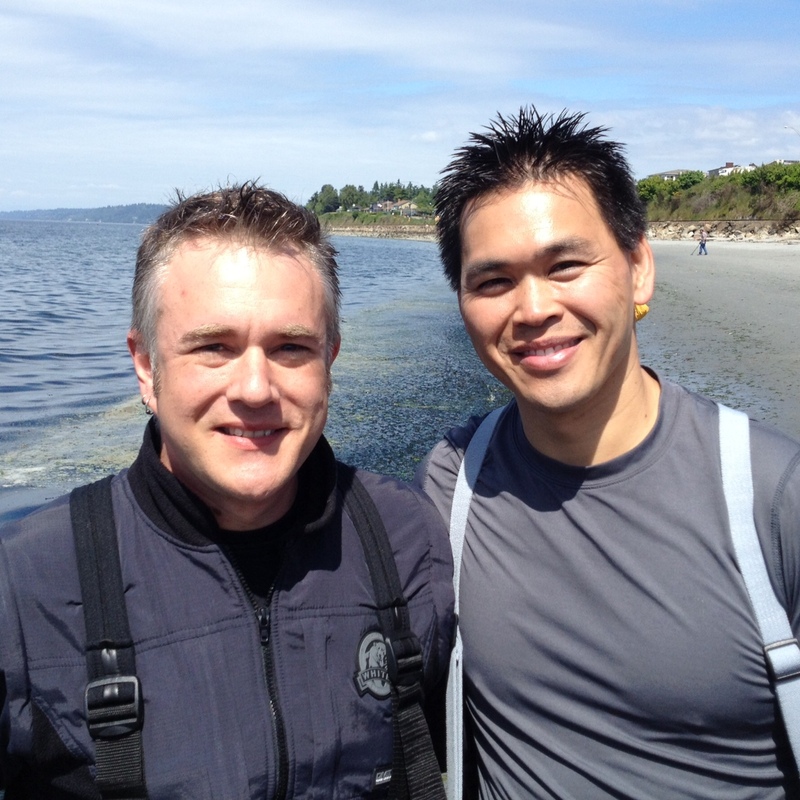 Both Chris and Chen trained as PADI Divemasters with Seattle Dive Tours Owner/Operator Richard Anderson and Seven Seas Scuba. When not leading guided dive tours, Chen works for The Boeing Company in the IT field. Chris works for Underwater Sports, a local scuba diving retail operator.